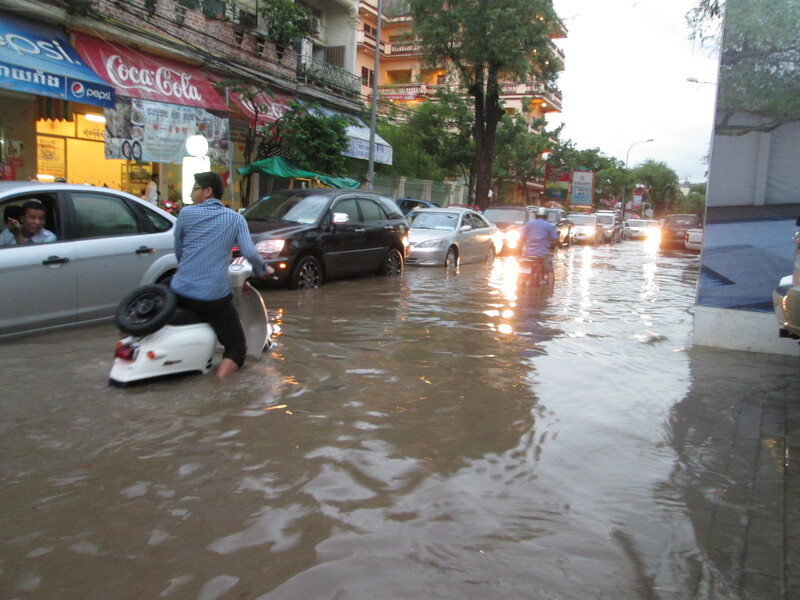 Rainfall-related flooding in Phnom Penh, Cambodia, July 2014. Urban planning needs to accommodate the possibility of increased flood risk resulting from more intense rainfall events. Adaptation is therefore a vital complement to mitigation. Indeed, the economic and political stability of many nations, and the material wellbeing of their populations, are likely to depend on how well they adapt to climate change and its impacts. Climate change will mean that existing systems and practices may not be viable in the future, as climatic and environmental conditions change, with knock-on effects on value chains, markets, commodity prices, purchasing power and a host of other factors. Existing systems might be ‘climate proofed’ so that they can continue to function - so-called ‘incremental’ adaptation. Alternatively, they may need to be radically altered or replaced with alternatives through ‘transformational’ adaptation. Climate change will change the sustainability equation: what is sustainable under current climatic conditions may not be sustainable in the future as climatic and environmental conditions evolve. Identifying actual and potential climate change risks, and identifying, prioritising and supporting adaptation needs, will be essential to securing economic and human development. In other words, much future development will depend on the integration or mainstreaming of climate change adaptation into development plans, policies and programming. While this is widely recognised in the community of practice emerging around climate change adaptation, there is a long way to go before adaptation is fully integrated into policy and planning processes, and the level of capacity to do so remains low in many countries and institutional contexts. Once adaptation strategies and measures have been implemented, there will be a need to monitor and evaluate their success and learn lessons, so that any necessary adjustments can be made. Are interventions really helping people to manage evolving risks more effectively and maintain or improve their material wellbeing despite climate change, or are they just delivering short-term benefits that will not deliver long-term resilience, or that may even undermine it (i.e. ‘maladaptation’)? For more information on the existing courses, explore our website or send an email to training@garama.co.uk. If you are interested in potential training partnerships (e.g. running one-off or regular courses outside the UK), please contact Nick Brooks, Garama’s Director, at nb@garama.co.uk.